On 17 August 2016, an Israeli football team, from the desert town of Beersheba, travelled to Celtic’s football ground in Glasgow for the first leg of their UEFA tie. 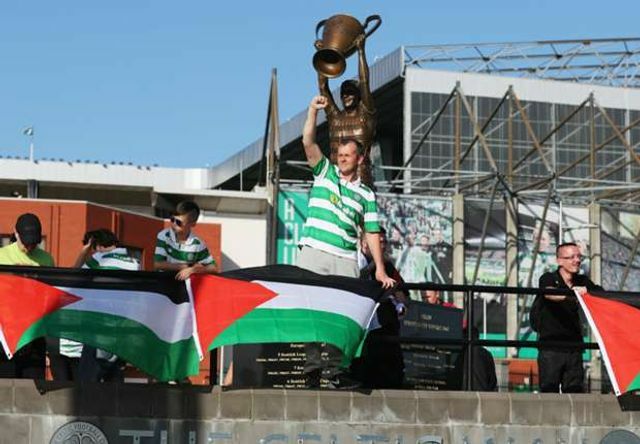 Many Celtic’s fans greeted their opponents by flying the Palestinian flag. UEFA fine them for that as it does not allow “any message that is not fit for a sports event, particularly messages that are of a political, ideological, religious, offensive or provocative nature”. Was UEFA correct? This complex story has been published widely and I do not intend to give another view. However, I would like to use this story to address one point about discrimination: context is everything. Imagine this. You run a business. On 15 November, the anniversary of the day that Yasser Arafat unilaterally signed the Palestinian declaration of independence, some employees of Palestinian descent bring flags to work and have a small inclusive celebration. On 12 May, your employees of Israeli descent celebrated Israeli Independence Day in a similar fashion. You know that both actions could be viewed as political, but you don’t see it that way – there is nothing wrong with expressing cultural feelings. All your staff enjoyed both events. But compare that with another scenario. A new recruit is joining. He happens to be Palestinian. Your Israeli employees specifically bring in Israeli flags on his first day. On the one hand, you think, “flying a flag is not illegal – free speech and all that! We allowed flags previously.” But that doesn’t feel right. Why not? Because context is everything. Your staff know almost nothing about the new recruit, his background or his opinions. It seems clear that their motive is to intimidate the guy. That intimidation is racially motivated (and bear in mind that unconscious motives count). That would be race discrimination in the form of harassment under the Equality Act 2010. I am not saying this is exactly the same as the Celtic fans and their flags. That issue is more complicated because of the complex link between football competitions and political affiliation. In addition, as the article points out, UEFA seems not to have been entirely consistent regarding flag-waving in the past. In the office, every situation will be slightly different as well. Hopefully in your business things will normally be simpler than this. But complicated issues will arise. If an action looks like it may be discriminatory, always consider it in context, and feel free to phone our lawyers for advice if need be. If you require further advice on these issues, you may wish to join our community; for example, we have this introductory page about employees behaving badly, and on elXtr we have a guide about unlawful discrimination. On September 22, Celtic will be hauled up in front of UEFA for a misconduct hearing. They will be charged after a section of fans waved Palestine flags during the first leg of their Champions League playoff encounter against Israeli champions Hapeol Be’er Sheva. UEFA have deemed that the Scottish side displayed an “illicit banner”. The rules of European football’s governing body state that clubs must not allow “any message that is not fit for a sports event, particularly messages that are of a political, ideological, religious, offensive or provocative nature” to be displayed within the ground.